Moses Chan Accepted Reporters' Blessings, Indirectly Admits "Double Happiness"
It was widely rumored Moses Chan and Aimee Chan are having a shotgun marriage. Last month, Aimee went back to Canada after taking a long leave for "personal reasons" and have not made a public appearance since. Yesterday her boyfriend Moses attended an event, and opened up for the first time. He laughed loudly accepting reporters' blessings and indirectly admitted that it is "double happiness" for the couple. 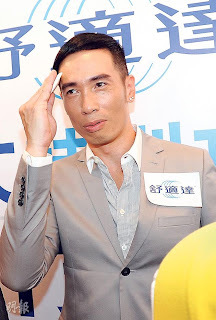 Yesterday Moses Chan attended a promotional event for a toothpaste brand with Christine Kuo. When the MC asked questions about marriage, Moses joked: "I'm prepared...to use up this entire stick of toothpaste to brush my teeth, so I could welcome everyone with smiles!" Moses expressed he's in a very good mood lately, and didn't even deny to the "double happiness" rumor, he heard reporters congratulate him and totally accepted it. He had wide smiles on his face and keep nodding. When asked about marriage and having children, Moses laughed: "I will announce when there are good news. Be patient. Your excitement makes me happy; Your blessings, I received all of it. You all are in too much of a hurry, I feel it!" Widely rumored on her maternal leave, Aimee is planning for a natural delivery. Moses did accidentally leaked a bit: "I don't know how to respond to you! (Prepared to be a father?) I won't know until the time comes!" Does his girlfriend like to have a boy or a girl? Moses laughed loudly: "I like to tell you good news when I have it. (Have you bought healthy products for your girlfriend?) Don't try to trick me!" Moses expressed he does not know how long Aimee is going to be on leave for. Asked whether his girlfriend is no longer going to be acting? Moses quickly clarified: "No. (The plan is to start a business, so she can be the female boss?) I don't want her to work too hard, let me handle it! (How will you be able to take care of your girlfriend too?) No choice, work is important. She has her family to take care of her. We keep in touch daily." It was said Moses flew to Canada earlier to ask for hand in marriage and that they're currently planning to have their wedding in their dream location Paris. Moses said: "I'm not telling you these things. I don't know, please allow me to maintain a low-profile attitude. I will tell you and won't leave you out of it, but only when I have good news to announce." Since Christine Kuo had rumors with Aarok Kwok, she gained a lot of popularity and jobs. However, yesterday at the event her limelight was stolen by Moses and his girlfriend Aimee's shotgun marriage rumors. She expressed she does not mind. When asked about her good friend's rumors? Christine said: "I'm not sure, been really busy lately and haven't been following. If its true, then I'm happy for them. Of course I will congratulate her and I can be her bridesmaid at the wedding. However, I have to think about being a god-mother to her child because its a huge responsibility." Christine is longing to find her own Mr. Right, but its about timing and fate. "If I were to choose, I would want a partner outside of this industry. Dating someone in this industry can get real complicated. (Is Aaron Kwok her Mr. Right?) I don't have the opportunity to get to know him, so I cannot say."